Certified Public Accountant May 2015 Board Exam Results (List of Passers, Topnotchers) - Balita Boss! The Professional Regulation Commission (PRC) released the May 2015 Certified Public Accountant Licensure Examination results. The official results were released on Thursday, May 21, 2015. The examination was conducted by the PRC on May 10, 11, 17 and 18, 2015 in the cities of Manila, Baguio, Cagayan De Oro, Cebu, Davao, Iloilo and Legazpi. A total of 2,132 out of 5,959 examinees passed the May 2015 Certified Public Accountant Board Exam, according to PRC (via PRC Website). CHIANG KAI SHEK COLLEGE graduate EUNICE MILLICENT ONG LI topped the May 2015 Certified Public Accountant Board Exam with a passing rate of 92.29 percent. UNIVERSITY OF SAN CARLOS emerged as the top performing school in the May 2015 Certified Public Accountant Licensure Examination as per Commission Resolution No. 2010-547 series of 2010, with 88.06% passing percentage or 59 out of 67 passed the exams. View or download the performance of schools in the May 2015 Certified Public Accountant Licensure Examination at prc.gov.ph. The Board of Accountancy who administered the May 2015 C.P.A. Board Exam were Joel L. Tan-Torres as Chairman, with Eliseo A. Aurellado, Gerard B. Sanvictores, Gloria T. Baysa and Concordio S. Quisaot as members. Registration for the issuance of Professional Identification Card (ID) and Certificate of Registration will be on May 27, 28 & 29, 2015. The date and venue for the oathtaking ceremony of the new successful examinees in the May 2015 Certified Public Accountant Licensure Examination will be announced later, the PRC said. In October 2014 Licensure Exam, a total of 4,123 out of 11,137 successfully passed the C.P.A. Board Exam. 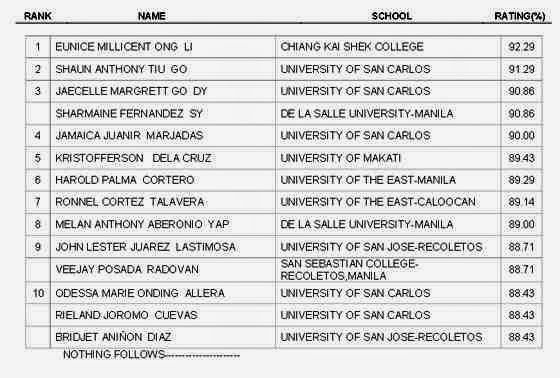 MARK ANTHONY BLANCO TACUBOY of UNIVERSITY OF SAINT LOUIS-TUGUEGARAO topped the October 2014 exam with a score of 91.14 percent.